Performance Automatics's 4R70W Street Smart System is the perfect way to back up your 5.0L Coyote swap! This item ships via Truck Freight shipping! Orders containing truck freight items incur a one-time $99 shipping fee. Performance Automatic takes a state of the art approach to putting a “Ford in a Ford” for those who choose the new “5.0 Coyote” engine. Late Model Restoration is proud to introduce Another “Street Smart” solution from Performance Automatic. Performance Automatic has created a sophisticated Ford 4R70W/Coyote Street Smart System to partner with this new engine. The PASS45103 comes complete with their Street Smart 4R70W transmission, the Smart Shift stand alone transmission controller that’s user friendly and is “no laptop required”, custom torque converter stall speeds from 2400-2800, dipstick/filler tube, complete transmission wiring harness, block plate, Coyote/4R70W flexplate, flexplate bolts, bellhousing bolts, and torque converter nuts. Complete with all the matching components you will need. This Coyote Street Smart System will handle 550 horsepower and comes with Performance Automatic’s famous “Lifetime” warranty. Give that Coyote engine the transmission that it deserves, with an easy to install Performance Automatic 4R70W Street Smart System. 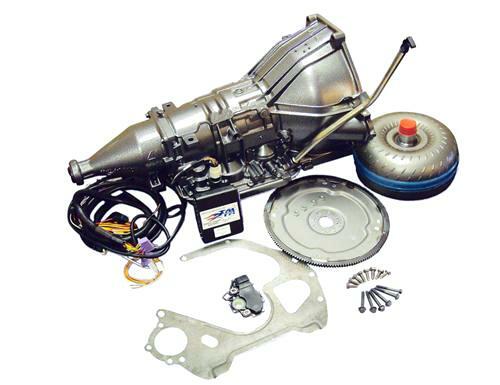 -If you are installing this transmission into a car that originally has a mechanical speedometer, you will need to run a Autometer or Dakota Digital gauge cluster. -If you are retaining the mechanical speedometer, we recommend Abbott Enterprises Cable-X or similar. Since opening in 1984,Performance Automatic has worked hard to improve the Mustang's automatic transmission. Their dedication to excellence and outstanding product warranty has made them one of the industry leaders for Performance Automatic Transmissions. From performance AOD transmissions, valve body kits, shift kits, rebuild kits, torque converters, and oil pans, Latemodel Restoration has you covered!